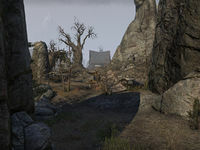 This article is about the crafting site in Rivenspire. For the inn at Velyn Harbor, see Harbor Customs Hall. Trader's Rest is a camp in southern Rivenspire, northeast from the Oldgate Wayshrine. The camp is home to a special crafting site, where you may craft items in the Hist Bark set. This page was last modified on 30 December 2018, at 15:56.